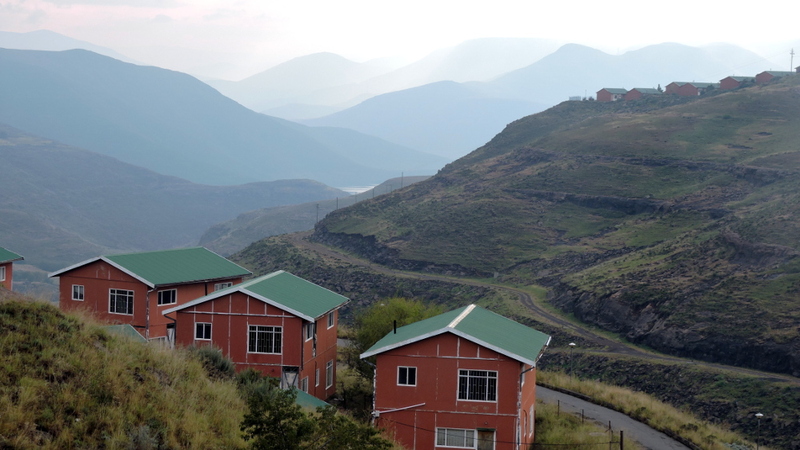 Before reaching Lesotho I hardly knew anything about the small kingdom, with its many mountains, and which was surrounded by South Africa. Shortly before I got there, I read that it was at high altitude. To get to know it better, I quickly stopped by. The end of South Africa was good training for Lesotho. There had already been a few climbs. When I crossed the border, I didn’t yet know which route to take. The start was very welcoming when I arrived in the late afternoon. 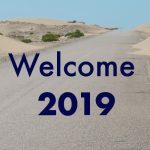 I was warmly welcomed and allowed to camp behind Customs. Next morning, I had a leisurely start. 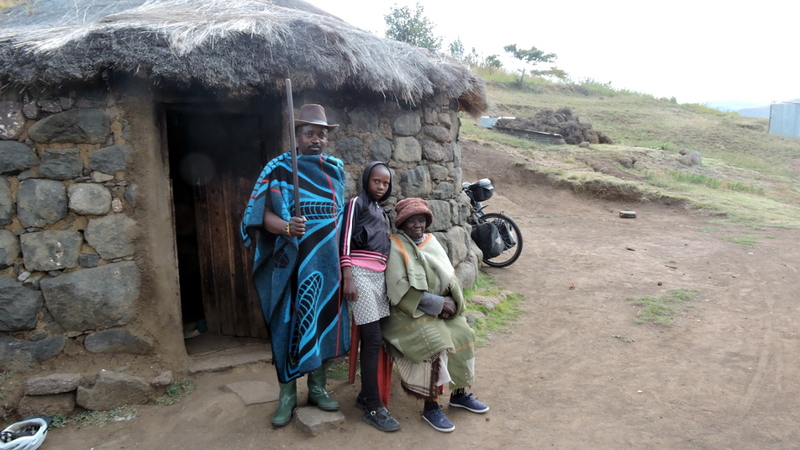 It was very convenient that near to the border I could stay with Tshebo, a WarmShower host, in Mafeteng. 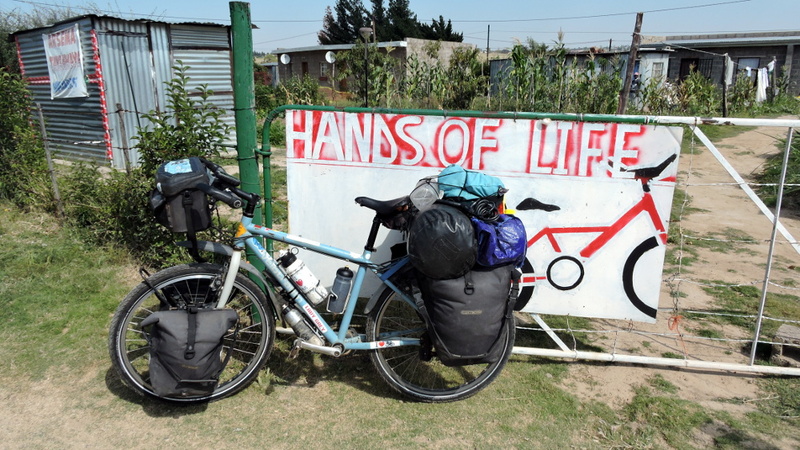 He dedicated his life to children and bikes and is founder of “Hands of Life – Bicycles”. 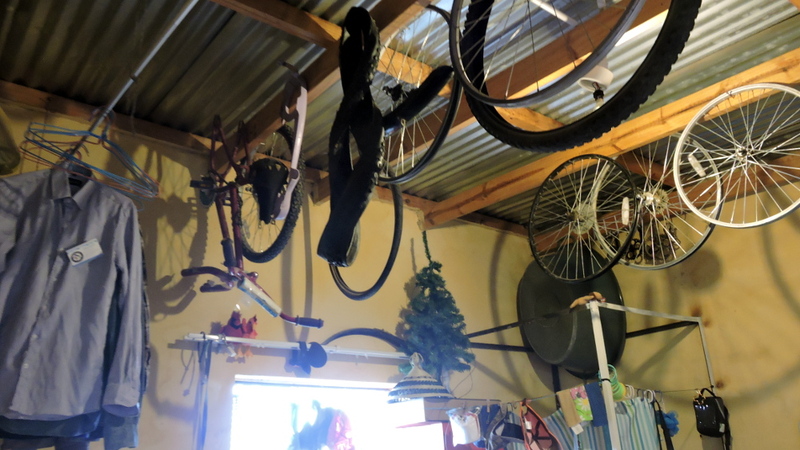 After school, boys come to his home, repair bikes, or are kept out of trouble in other ways. This way the boys were well looked after when school finished. So far, unfortunately, only for boys. 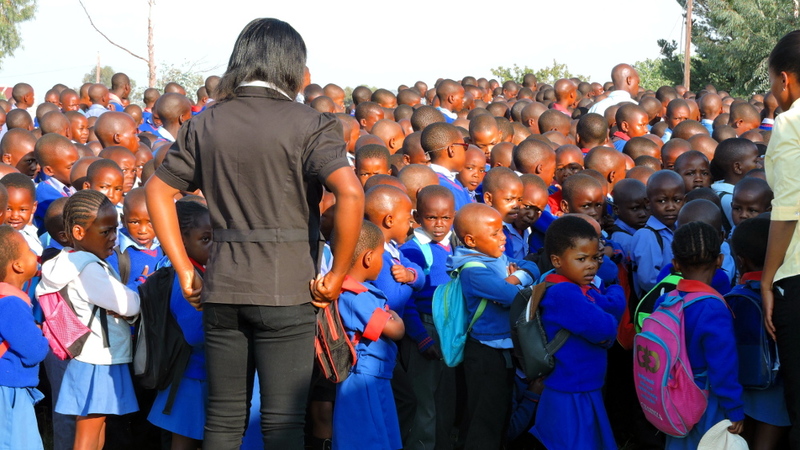 At this age (between nine and fourteen) boys weren’t yet interested in girls. When I asked why there were no girls in their group, they laughed shyly. What a pity. I hoped that an enthusiastic woman could be found who would start a similar group for girls. 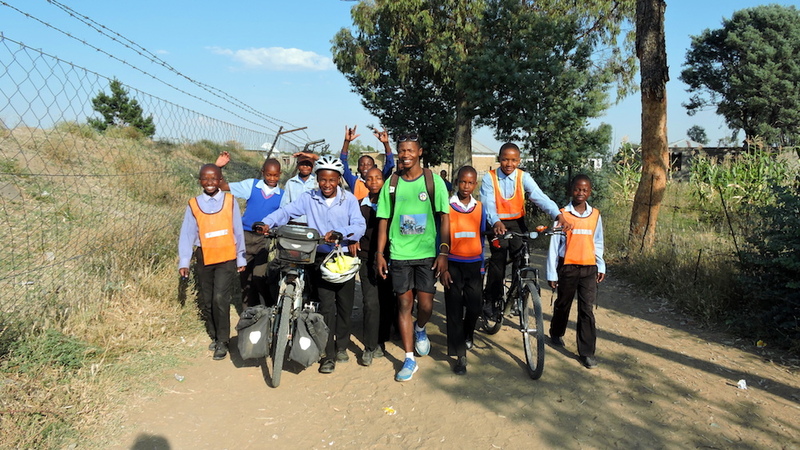 Tshebo took me to school, where he was a volunteer teacher for life skills. For many he was a person of confidence and a role model. 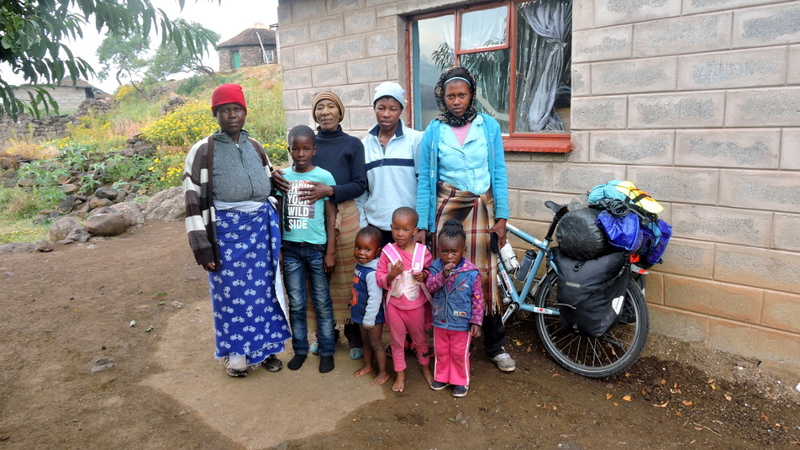 Tshebo grew up in South Africa, knew a different way of life, and what opportunities there were. I was delighted to accompany him to school. In front of the whole school, I was allowed to speak about my travels. 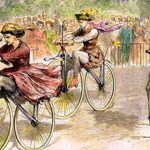 Biking wasn’t just for boys, girls could also have fun with it, and learn a lot. By now, I was more knowledgeable about the country and its people and was ready to tackle the mountains. 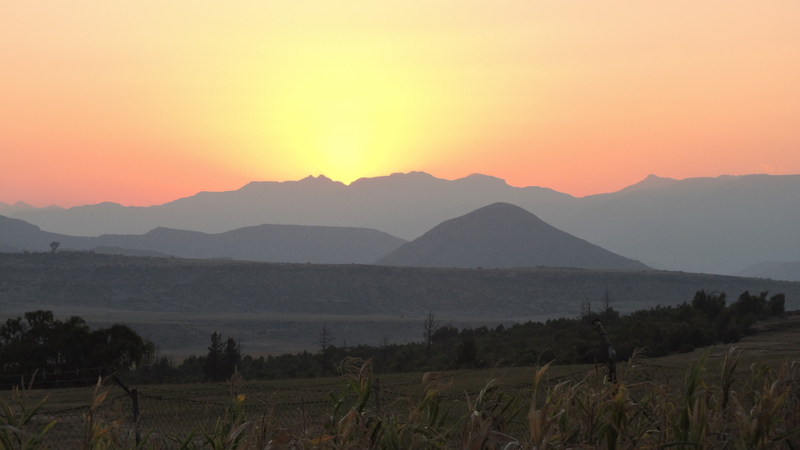 This small kingdom appeared to be home to all mountains south of the equator. They were so closely together, that there was hardly space for valleys in between. One pass chased the next. The pass where you called upon God to help you, was one of the easiest and lowest. On this day I tackled three passes. 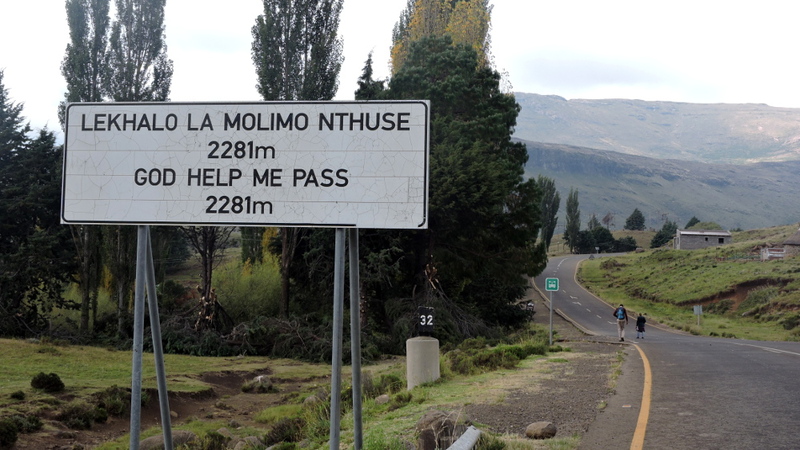 Several cars stopped on my way to the last and highest pass and offered me a ride, which I graciously declined. It was called the “Blue Mountain Pass” and was 2.633 meters high. And it started to pour when I reached the top. Easy to imagine that at such altitude, it quickly got cold. There was nothing up there, no shelter, only rain, thunder, and lightning. I quickly left but it could have been so pretty there. I could only guess at the view of Mohales Reservoir. 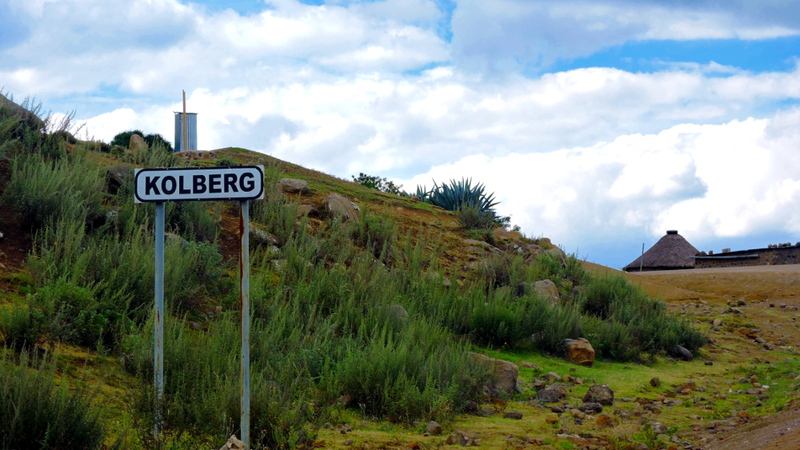 The descent was 15 kilometers and I was grateful to warm up when there was a short climb. I couldn’t remember having ever been so cold. Finally, I reached a village and immediately went to the first shop which had a storage area up front. I was shaking so much, I couldn’t say anything, and simply stood there was cold. Once again, when I felt the lowest, I met the nicest people. Everyone quickly scrambled to make water for a hot foot bath and for tea. They took me to the back of the store room where I could get out of my wet clothing. They bathed me in hot water and rubbed lotion on my skin. When I was swaddled in dry clothes and drank hot tea, I soon felt better. Now I only needed a place where I could pitch my tent. That was quickly taken care of when a young employee offered me a place in her one-room home. There was a small petroleum stove which warmed the place. Next day I could enjoy the beauty of the mountains. The sun was out as if there had been no bad weather on the previous day. Far below was the Mohales Reservoir. Thanks to the Seguyane River which had cut a deep valley into the mountains, I descended to 1.800 meters which of course meant a climb afterwards. Down there it was warm and I could dry out all my wet things. I spent the night in a very modern school which wasn’t yet finished. 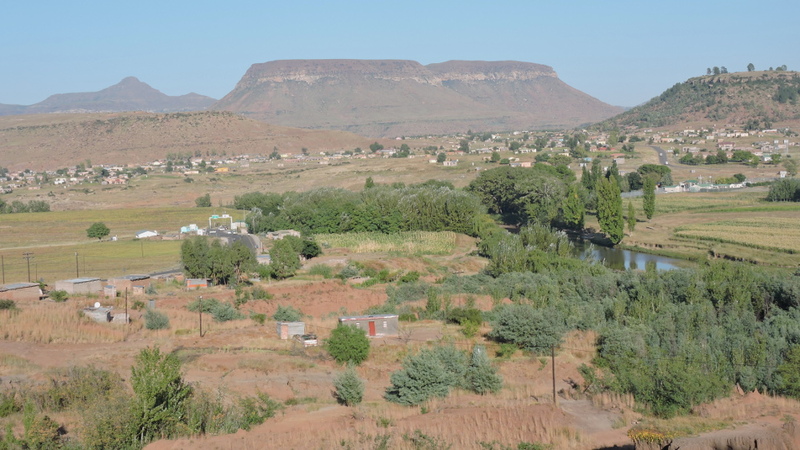 A very wealthy man from the capital, Maseru, had financed it, including a giant church. To allow him to come for quick inspection visits, there was even a heli pad. The higher I went, the more stunning the scenery. 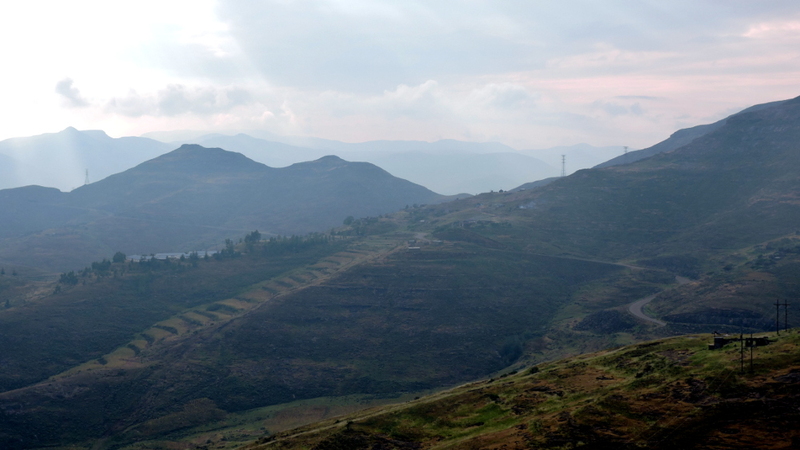 The Mokhoabong Pass went up to 2.900 meters. 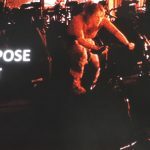 Maybe it wasn’t so steep, or I was stronger, but I hardly needed to push the bike. There was nothing after 2.600 meters but further down I had sometimes heard the bells of cows and sheep and the singing of a shepherd. 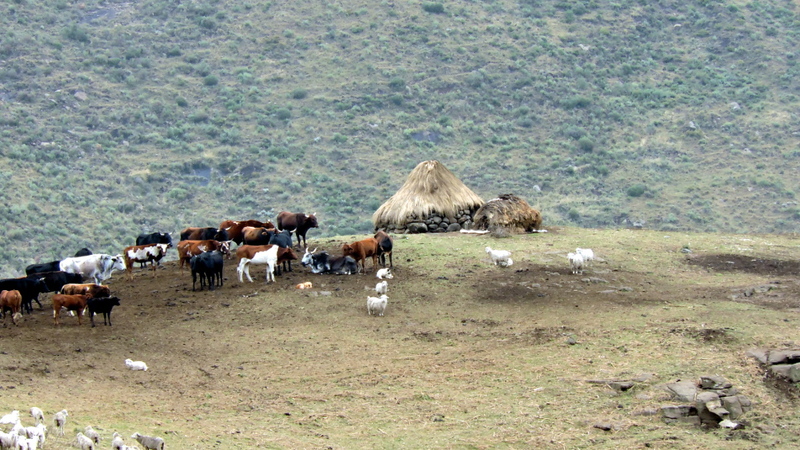 There were a few isolated huts away from the road. Bikes and cars were useless and only donkeys or horses could reach the farmsteads. 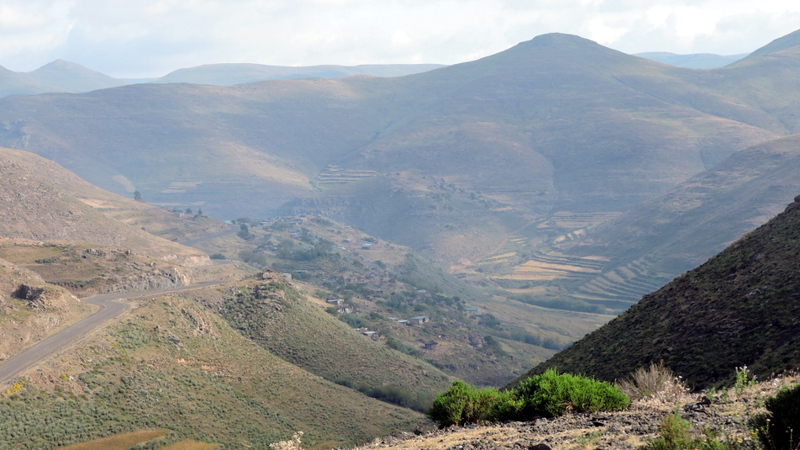 There was a steep descent towards Thaba Tseha, the first larger town. The noisy loudspeakers and the general mayhem quickly drove me away. 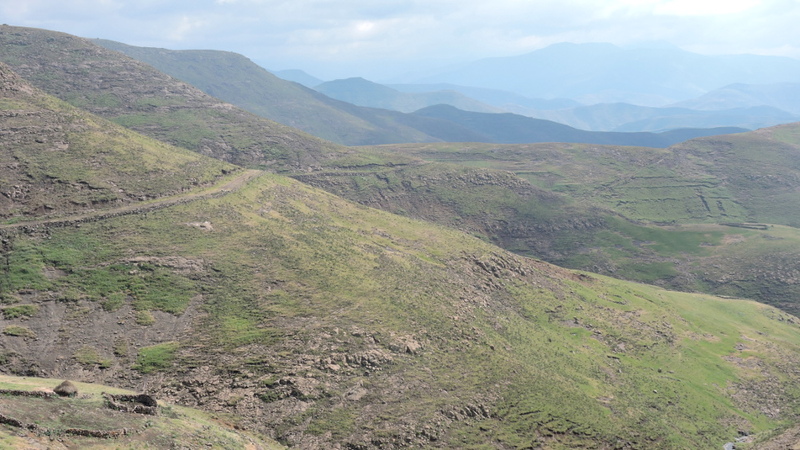 In Lesotho, the Chinese were also hard at work and a lot of roads had been paved and were (still) in good condition. The highest passes had already been tarred. 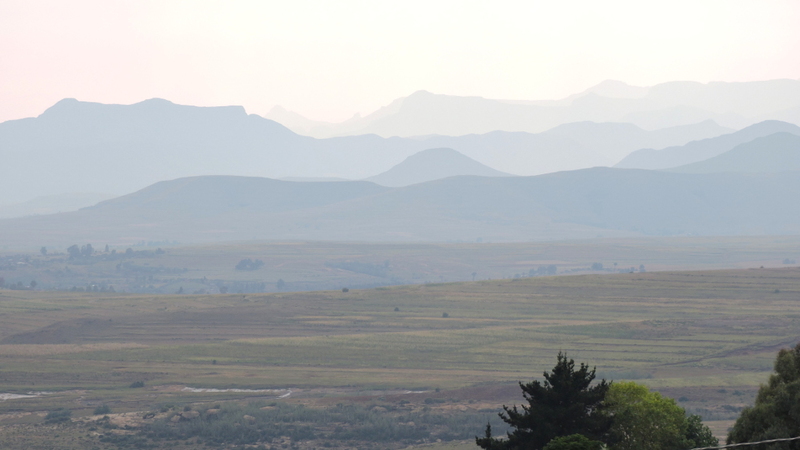 But there remained some gravel roads, for example between Thaba Tseha and Katse. For local conditions, this stretch was almost flat. The serpentines were at the edge of a gorge. Once again, I was allowed to stay with the grand chief. Such an invitation was nice but it meant that I had to push my loaded bike up to the hut. Not easy, very steep, and no trail. But the views were once again spectacular. Now I only had to cover 25 kilometers until I reached the paved road. 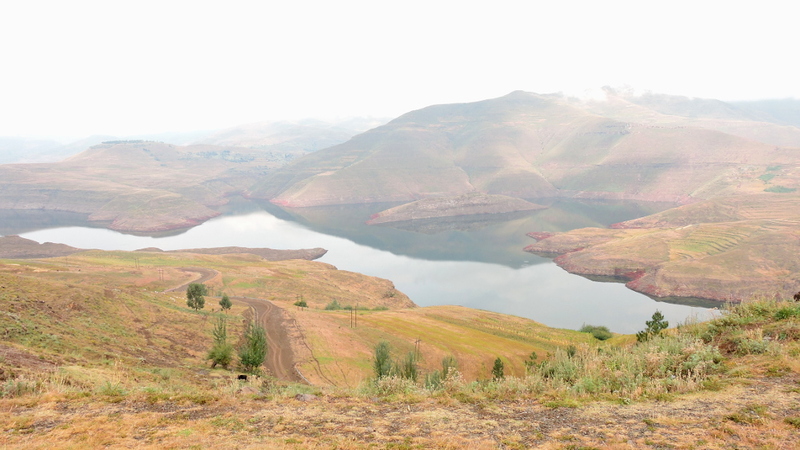 Then I descended a few kilometers to the Katse Reservoir. On the other side there was an equally steep but much slower ascent. From there I had a beautiful view of the lake which only had little water. Thereafter one pass chased the next. I was completely exhausted. A view up ahead, the next pass. Oh no! A woman called out to me, I could stay there. Thank you very much! Even more so because it soon started to rain, and I was very grateful to the woman (in the dark grey turtleneck). 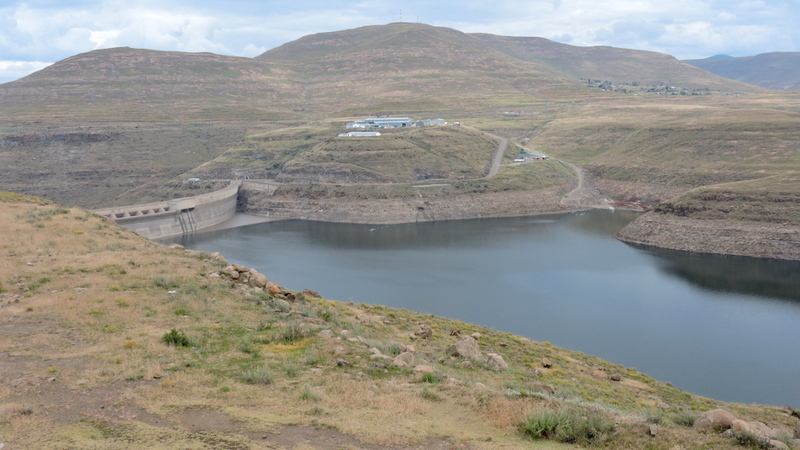 The Katse Reservoir which was a hydroelectric dam was around the corner but they didn’t have power. They charged their smartphones and tablets with solar panels. 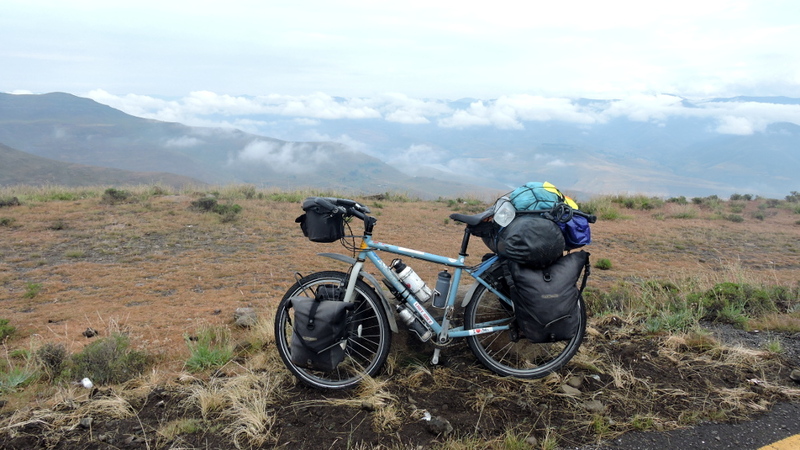 Next day I had recovered to tackle the next pass (2,600 meters). 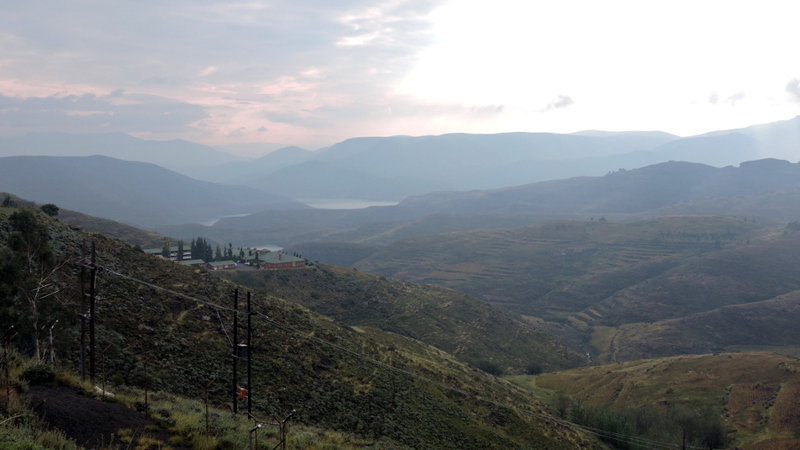 How could it be different, the descent took me back to the Katse dam. 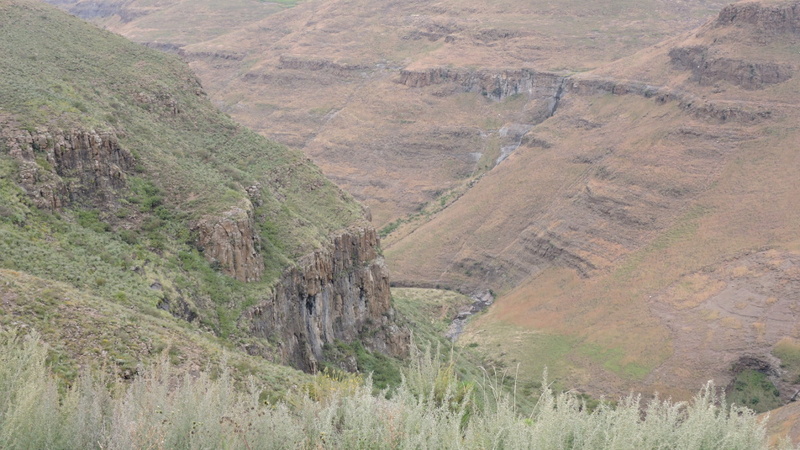 Down below (the lowest altitude in Lesotho was 1,000 meters) was the longest bridge in the country. In Lejone I could top up my calorie and blood sugar count. Shortly after the town, there was of course an ascent, I met some motor bikers. They wondered how I could make it up to the top. 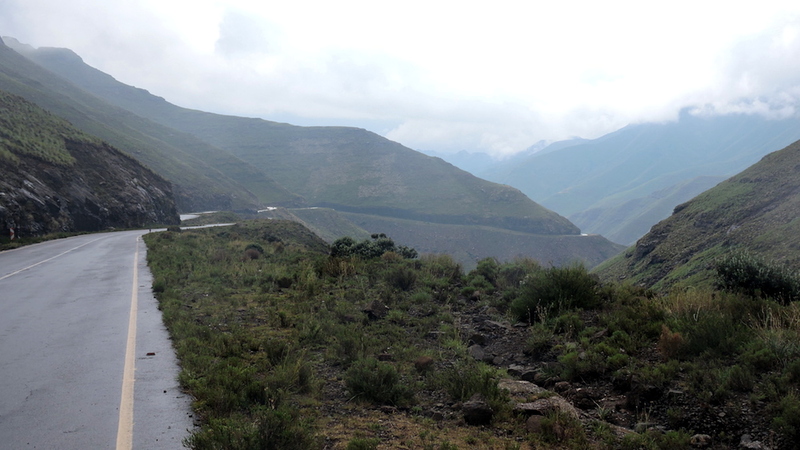 I was relaxed but when they told me that the road would reach 3,000 meters, I wasn’t so cool about it. The weather went from bad to worse. First, I was in the clouds, then it started to rain. 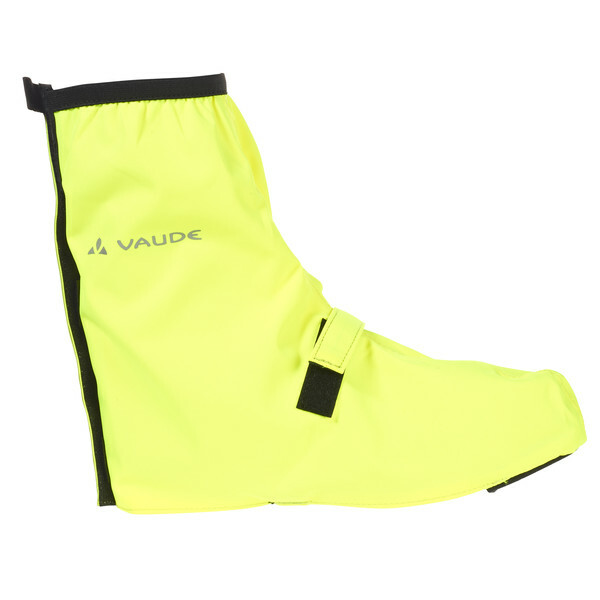 For the first time in Africa, I put on my rain pants and gaiters. It was increasingly steep and I had to push. Often when it rained here, there was also lightning which was very scary. There was a high-tension transmission line nearby and lightning strikes hit the towers. There was no shelter anywhere and I had to continue. When I passed between rocks, I thought I had reached the highest point. But there were another one hundred meters to climb. There was a short descent and then I climbed again. There was no visibility, I couldn’t see 50 meters in front of me. I was surrounded by fog. Sometimes in life you just have to pull through and this was one of those situations. 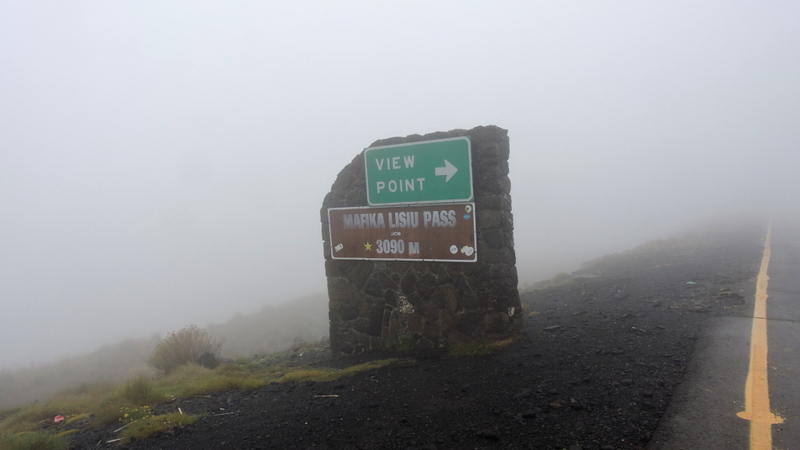 Finally, I reached Mafika Pass at 3,090 meters. Sadly, the view point was covered in fog and there were no views. There was a steep descent, soon I was below the clouds, and could marvel at this gorgeous pass. The rain continued as I made my way to Pitseng. School girls took me to the large police compound where I wanted to camp. When the policeman in charge saw how cold and wet I was, he took me to an office and said I could sleep there. What luxury! It was warm, dry, and even had power. This was how I spent the last night in this wonderful kingdom. It was almost boring the next day, when there was no pass but more traffic on my way to the border at Buthe Buthe. The mountains of the last few days had been tough on my body. 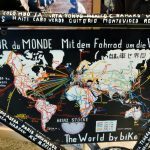 I had spent ten days in country and covered 562 kilometers. Unfortunately, I didn’t know how many meters I had climbed. 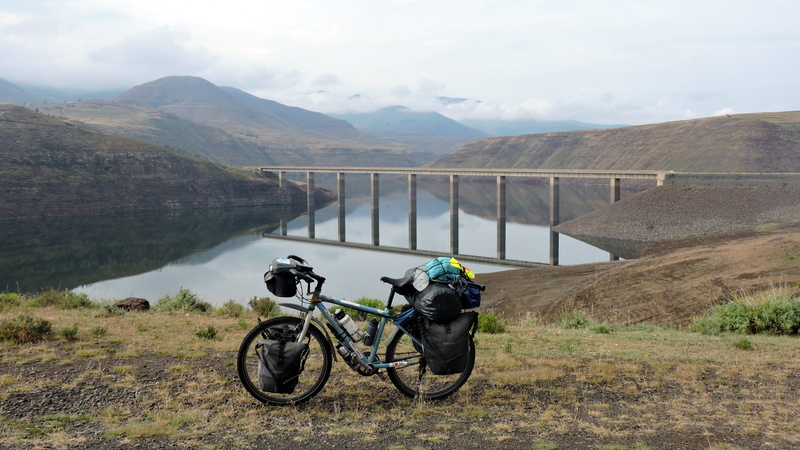 If one isn’t afraid of mountains, Lesotho is a great country for cycling. 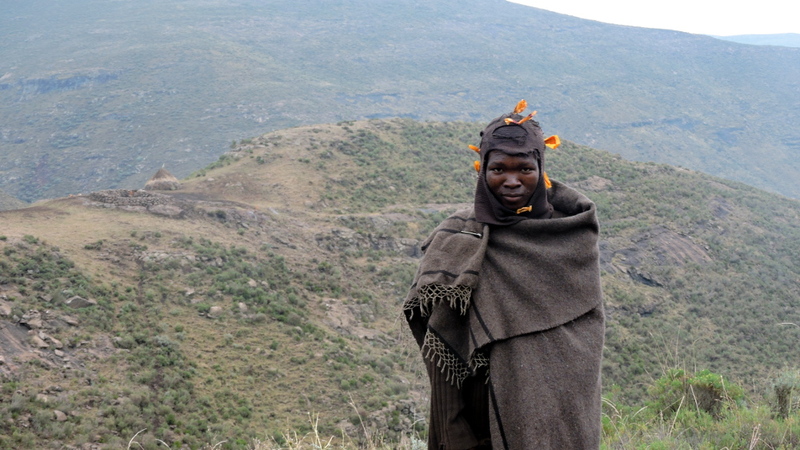 In my next blog, you’ll read about the northeast of South Africa and Swaziland. 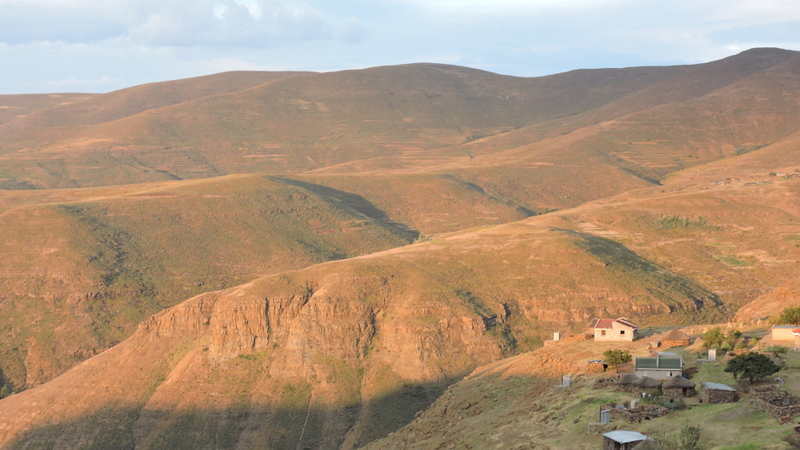 In Lesotho there is no flat roads. You are going up or going down.